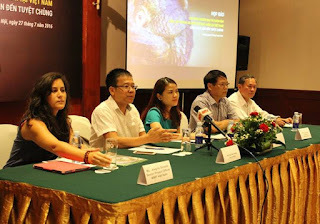 Education for Nature - Vietnam (ENV) today hosted a press conference calling for a complete ban on the commercial farming and trade of endangered species. The media event followed a lively round-table meeting held yesterday (July 26) with representatives from law enforcement agencies, decision makers, scientists and conservation experts. Commercial farming and trade of wildlife is a hotly contested topic in some circles where proponents argue that commercial trade benefits conservation while opponents including ENV warn that commercial trade stimulates demand, compromises conservation, and in its current form in Vietnam, has little or no benefit to conservation. The results of an investigation of wildlife farms in Vietnam conducted by ENV show widespread laundering of wild sourced animals and abuse of regulations at all of the licensed farms that were inspected. ENV’s position is to call for a 100% ban on the commercial farming and trade of endangered species that are protected under Vietnamese law or international treaty. More photos of the event can be found at ENV’s official Facebook page.